Join Aglaée as she interviews Amelia Barnes to first talk about the benefits of yoga for moms and the important role yoga has played in her life, including during both of her pregnancies and postpartum periods. In the second part of the interview, you will learn about Amelia's incredibly inspiring story with her first baby, Landon, unexpectedly passing away only 4 days after he was born and how he saved his sister's life. Amelia Kathryn Barnes is a yoga teacher, retreat facilitator and small business owner. She teaches at Moksha Yoga Winnipeg and is a guide at the yoga and wellness website oneOeight.com. She is also the creator of PranaVidaStyle, a unique line of inspired and Canadian-made yoga apparel. Amelia lives in Winnipeg, Canada with her husband Justin, daughter Lily and their big white mutt Cody. [3:27] Welcome Amelia! - Let's talk about yoga for moms! [14:10] Anxiety about going to a yoga studio for the 1st time!!! [37:30] Amelia's thoughts on "letting go" vs "setting free"
Join Aglaée as she interviews Parijat Deshpande about high-risk pregnancies and the importance of emotional health and stress reduction during that crucial time of your life. Whether you are experiencing a high-risk pregnancy or not, please give this episode a listen so you can share it with the moms who need it and I promise you'll also learn a few practical tips to apply to your life today (pregnant or not!). Parijat Deshpande is the leading perinatal wellness expert who specializes in working with women during a high-risk pregnancy. She educates and guides women on how to manage their stress and anxiety so they can have healthier pregnancies, decrease their risk of preterm birth and give their baby a healthy start to life. Parijat is a clinically trained therapist, a women’s wellness expert and an experienced speaker on the impact of stress on health and wellness. 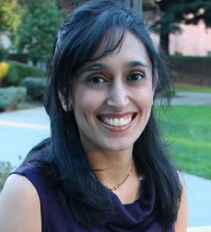 She has over 4 years of experience as a Psychology Lecturer UC Berkeley and is the founder of MySahana, a South Asian mental health nonprofit. Parijat is also a certified wellness coach, a certified stress management coach and a certified marriage educator. [33:20] How self-help tools can actually INCREASE anxiety! [35:55] Forgetting about self-care activities during a high-risk pregnancy!